Why would I want to vacation in Tortola? I get questions about Tortola all of the time, but this is my favorite one. My answer is always the same. "It's hard to get to, but easy to fall in love with!" 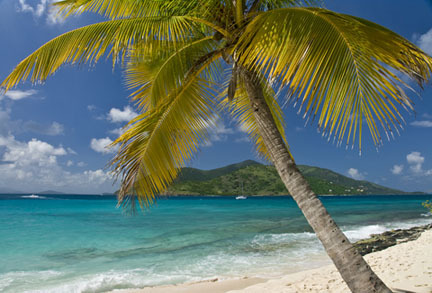 Tortola is the largest of the British Virgin Islands(BVI) and has something for just about anyone and everyone. This site is dedicated to the savvy traveler, the traveler who is looking to discover something out of the ordinary in the Caribbean. If this sounds like the kind of vacation you might be interested in, then by all means look around a bit. Find out where you can comb the beach all by yourself or uncover where the best restaurants and bars in the West Indies can be found. I am going to be your tour guide. My name is Casey and I'm your average red-blooded American. I've had many adventures around the world. Exploring this jewel of the Caribbean was by far my favorite! Apple Bay with Jost Van Dyke in the background. - The beaches rarely have more than a handful of people, so you can have a bay all to yourself. - The people are warm and gentle. They are happy to lend a helping hand or point you in the right direction. - The hotels are an eclectic mix. Some are new, some old, some cheap, some luxury. - An oceanfront villa is the reason I work so hard all year. - I can snorkel in a coral oasis and hike up to a mountaintop vista all in the same day. - Limin', as they say on the island (find out why this is my favorite pastime). - It's the best sailing in all of the Caribbean. - I uncover something new to do or see with every visit. I built this site to show my passion for what the island has to offer. 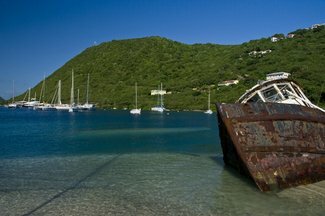 I wanted to show what makes Tortola so much different from all of the other islands in the Caribbean. Let me invite you to experience the island through my eyes!